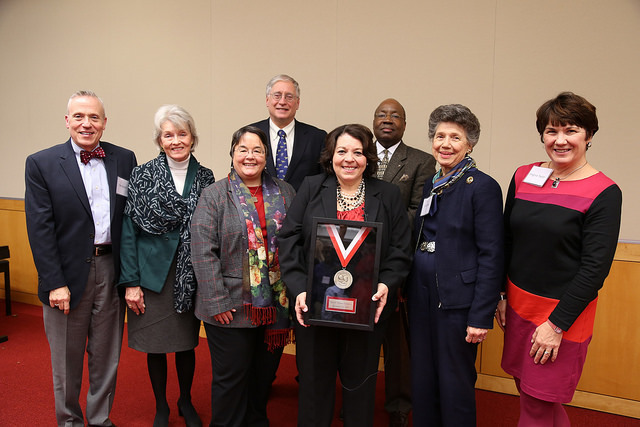 North Carolina State University honored Muriel Thomas Summers at the Friday Institute for Educational Innovation’s Friday Medal presentation on Wednesday, November 19, 2014. 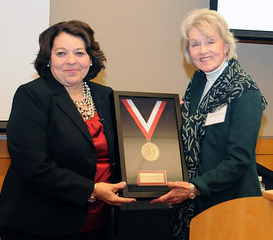 The Friday Medal is awarded annually in honor of William C. Friday to recognize significant, distinguished and enduring contributions to education and beyond through advocating innovation, advancing education and imparting inspiration. Summers is the principal of A.B. Combs Leadership Elementary School in Raleigh, NC and co-author of The Leader in Me, which is the name of the paradigm Summers designed that is inspired by Dr. Stephen Covey’s The Seven Habits of Highly Effective People. The Leader in Me school model has reached schools throughout the world. To date, Summers’ innovative vision has inspired nearly 2,000 schools in 25 countries to implement the program’s guiding principles. “For 38 years, I will never forget the feeling that I felt when I listened to his words. He reminded us that it didn’t matter where we came from, it didn’t matter how much money we had in our pockets. What mattered the most was where we were going,” said Summers. “He reminded us never to take for granted the gift we had been given, the gift of a great education… His wish for us was to search and to hopefully find that which would be our life’s calling. I took his words to heart, and I found my voice by majoring in education.”Mr. Friday had a great impact on this year’s honoree, as Summers had the opportunity to hear him speak when she was a student at the University of North Carolina in Chapel Hill.